In the Fourth Assessment Report of the IPCC (AR 4) from 2007, vulnerability is a core concept that describes the degree to which a natural or social system is susceptible to, and unable to cope with, adverse effects of climate change. contributes to an integration of the two research realms of climate change adaptation (CCA) and disaster risk reduction (DRR). 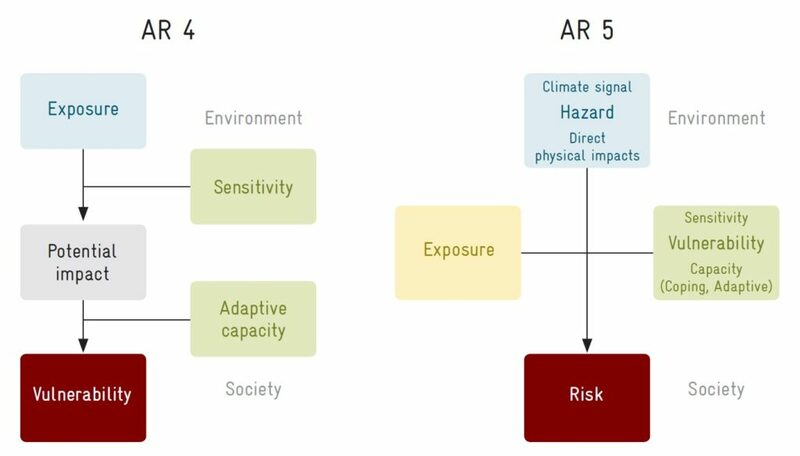 The AR5 risk concept focuses on assessing the risk of climate-related impacts that may harm a system. Risk is described as result of the interaction of vulnerability, exposure, and hazard. The vulnerability of a system is now only one component of the risk that may increase or decrease the potential consequences of a hazard. What are Vulnerability Assessments (VAs) and Climate Risk Assessments (CRAs)? Vulnerability Assessments (VAs) and Climate Risk Assessments (CRAs) help to identify the nature and extent to which climate change and its impacts may harm a country, region, sector or community. The assessments of vulnerability and/or climate risks is therefore a central component of adaptation action. What are the reasons for undertaking a Vulnerability Assessment or Climate Risk Assessment? Vulnerability Assessments (VAs) and Climate Risk Assessments (CRAs) are important tools to support decision-making undertaken for different purposes. They can be used to identify main risks and impacts on people, regions and sectors as well as their vulnerability so that resources are allocated accordingly; they can be used in the design of adaptation policies and projects, and to establish a baseline against which the success of adaptation policies can be monitored. What are the challenges and how can they be overcome? The great variety of approaches to Vulnerability Assessments (VAs) and Climate Risk Assessments (CRAs) is often confusing for practitioners, but good overviews of the different approaches are available. Apart from finding the most suitable methodology, challenging aspects include the availability of data and the capacity to analyze it. In addition, VAs and CRAs often require specific technical expertise and significant coordination between different disciplines and actors. What main lessons have been learned from application? Vulnerability Assessments (VAs) and Climate Risk Assessments (CRAs) need to match their context in order to be able to provide meaningful and useful conclusions. VAs and CRAs on a larger scale are very useful for gaining initial insight when preparing VAs and CRAs on a smaller scale. VAs and CRAs on a smaller scale or focusing on special sectors, geographical areas or communities help to identify concrete adaptation measures for reducing vulnerability and risk. A variety of guides and tool as well as training descriptions are available for vulnerability and risk assessments under different conditions.